I sure hope that you do since the second part is waiting here for you to download it! 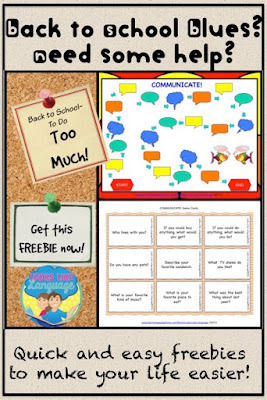 Send a thought of thanks to Classroom Freebies Too for motivating me to get started on this year's worth of free downloads! This worksheet set addresses early literacy skills, so it is great for early childhood educators, SLPs and home schoolers. Changing themes is a great way to keep kids practicing skills over and over until they have truly learned them! 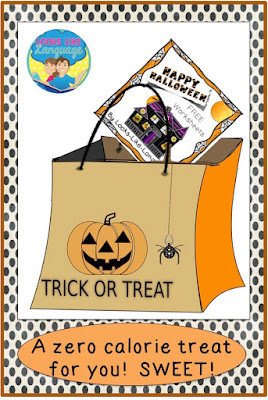 Download the updated Halloween freebie on this blog post. Then stop by my store to see what other fun stuff I have! A sweet Halloween treat is in the bag! Halloween? Sweet! And the treat for you is in the bag! Even better, it is calorie free! 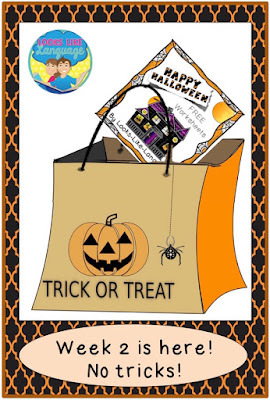 I've started early enough that you will be able to download all sections of this cute Halloween themed freebie for early literacy skills before the holiday has arrived. If you like to be ahead of the game, remember that you can sign up for my newsletter to get the monthly freebies in one complete download. Plus, my newsletter subscribers get access to occasional exclusive freebies! How sweet of a deal is that? You can download this week's section of the complete, free updated packet here! Data Made Easy! 5 Easy Tips and a Big Freebie List! 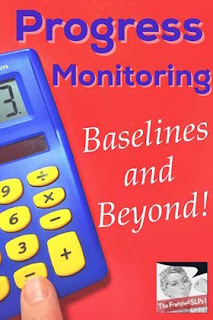 Earlier this month, I joined with The Frenzied SLPs to give some tips on baseline monitoring and taking data. Did you miss it? Click here and follow the links to get some more great tips. 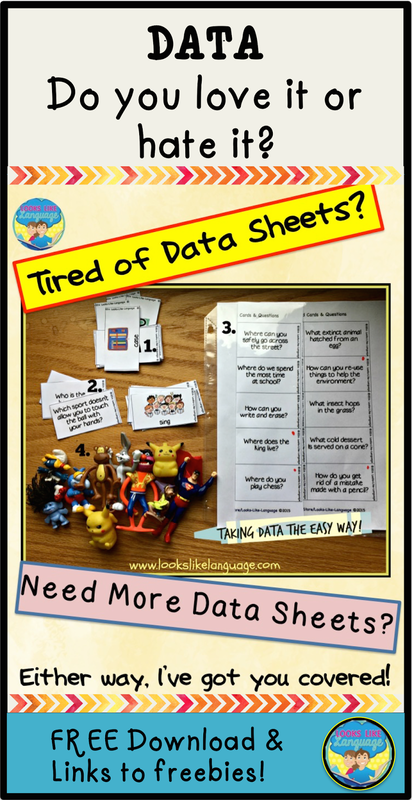 Well, now that I am back to work and in the swing of assessing my students’ skills, I though that I’d bring home my binder on data collection and let you know some of the links to resources that I found to be helpful. 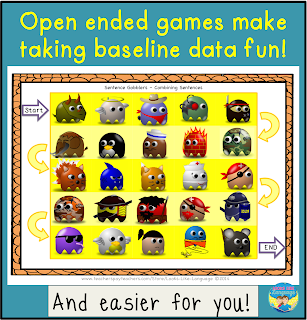 If you read my last post, you know that taking data is NOT my favorite! I like the interaction in therapy and figuring out the best strategies, prompts and visuals to support communication growth much better, so I like to keep the data part easy. For me, that means thinking about the functional skills I’d like to see my students doing by the end of the year, before I even begin therapy. Then, I see how well they do in that activity, whether it is a worksheet, a language sample, or an authentic assessment in the classroom and take both qualitative and quantitative data to start the year. After I get a sense of their skills, I start to take my regular session data. I have found that it is very easy to get involved with helping students and not really notice subtle cues that I have provided so frequently, I don’t even notice that I’m doing it anymore! So, midyear I like to give that same pretest or do the same activity, paying careful attention to letting my students do it independently. This lets me see if they are actually learning to use the target skills without my intervention but still giving me time to make changes, if needed, before the end of the year. Once I’ve assessed whether changes are needed, it is back to the regular data again. Over the course of my many years of therapy, I’ve tried a lot of different ways to collect data. The simplest methods for me are when the data collection is built into the activity. 1. Get out sets of picture cards in multiples of 5. Place the correct response cards in one pile and the incorrect responses in another. Variations: stack them in different directions, place the error cards face down and the correct ones face up, set the error cards in a different location. 2. Play a game or do an activity with pieces, like tossing balls into a hoop, throwing packing peanuts into a seasonal container, or tossing pompoms into an egg carton. Assign each student a different color and only let them take a turn if their answer is correct. At the end of 10 responses, you get a quick count as you have them clean up. 3. Use numbered question lists placed in a page protector. Mark with a crayon or erasable marker right on the sheet. For students who are sensitive about mistakes, make a small dot for incorrect responses right next to the question. 4. Start with a set of 10 interesting things in a pile in front of you. If the student answers correctly, one piece goes in a pile next to him. If the answer is wrong, you get to keep it. Many students will find this fun with tokens, as they are challenged to get them all away from you. Other students need the ‘interesting’ things to be something they can interact with after, such as different colors of crayons for a picture, the pieces to play a game as described in #2, or small toys they can play with for a minute. If your students are at this level, you might also need a container for their toys to wait in, while yours just disappear from view. 5. Of course, there are the standard coloring or daubing worksheet activities that let you see the total easily, too. My students like doing these with dry erase markers with the sheets placed in page protectors, which also cuts back on printing and photocopying. Have you noticed that different activities and group sizes lend themselves better to different types of data sheets? I think so! 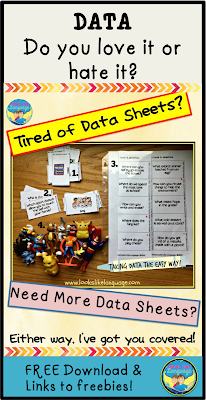 To help you out, I asked my blogging friends on TpT to share the links to their FREE data sheets. Please leave kind feedback (that reads 4.0, we all want A’s!) if you decide to download as a thank you for their time and effort. This is an impressive variety of free data collection sheets, so I’m sure you will find something to suit your needs! Links to FREE Data Sheets! This data sheet is one I found useful for working with groups. Sometimes it seems that I never have enough hands, and being able to collect all the data on one sheet can be very useful. You can set it up so that your groups are listed in the order they are scheduled, and just flip the page after the third group. 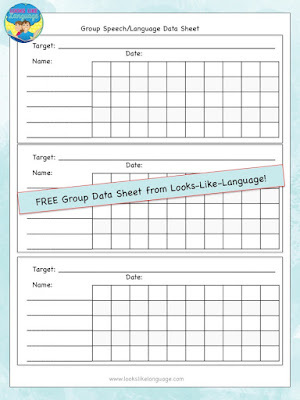 You can also use one sheet for each group, listing a different goal in each section. The PDF of this page can be downloaded here. So, everyone is back to school now. Fall can't be far off! I find it very helpful to have a few easy to implement activities around, ready to go, for those days that just aren't going as you planned. 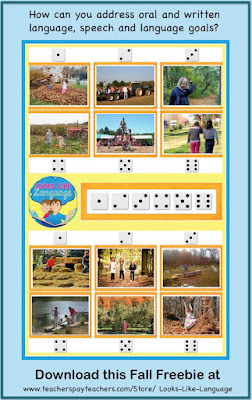 Seasonal activities are very easy to use along with whatever theme or target you may have. This freebie can address grammar, sentence structure, writing, narratives or even carryover of articulation skills! The real photos add to its interest for students and games are always fun! Grab this fall themed activity at my store for FREE! Be sure to leave kind feedback if you like it. I know your mom taught you to say, "Thank you!" Truly, it means a lot when nice feedback is received! Enjoy! Data! I know some SLPs love taking and analyzing date, but I'm NOT one of them. I learned to do it, and do it well, because it is a vital piece of the work we do. I actually thought that I was good at analyzing data until I started trying to apply my skills to running a blog and TpT store. SURPRISE! I'm not a natural at data. Thank goodness, then, for the training I received in graduate school! The Frenzied SLPs are tackling Baseline Performance and Measuring Progress this week to help your SLP life be a little less frenzied! Figuring out ways to qualify/quantify student progress is important for measuring student progress and filling out session notes for medicaid, but I've found it is even more important for our clinical techniques. 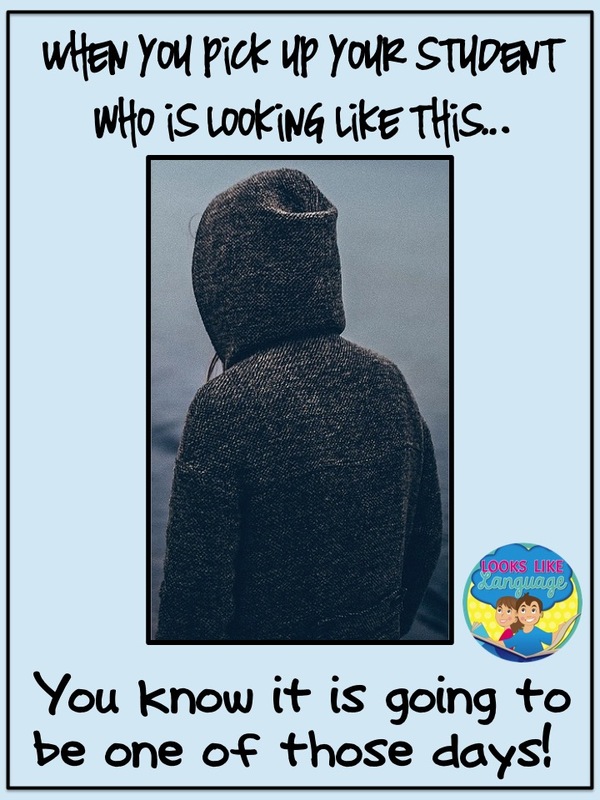 Anyone who has worked with students know that every child is unique. Students with "normal" cognitive and language skills are able to learn without specialized teaching methods since their brains are able to make connections between concepts and retain information. Our students with disorders need a bit more help along the way. Over my many years of therapy, I've developed a large repertoire of strategies to use with my students, but it is only by taking baseline measures and frequent progress checks that I am able to tell if the strategies I am using are actually helping a particular student. If I find that it isn't, it is back to the drawing board to use another approach! What type of educational program is the student in? A student who is in an academic program has different long term needs than a student in a life skills program. What behaviors is the student currently displaying that is hindering reaching full potential, no matter what type of educational program? If you address the communication needs that underlie the student's behaviors, you are more likely to be supporting their ability to learn throughout the day. How can all the current IEP goals and student needs be addressed in a holistic way that supports functional learning and carryover of skills? Since my students have significant deficits in making connections between and retaining new knowledge, I need to constantly connect what I am teaching with the information learned earlier in the year and review skills. What functional application of the goals can I expect my students to achieve during this school year, given all of the previously mentioned factors? 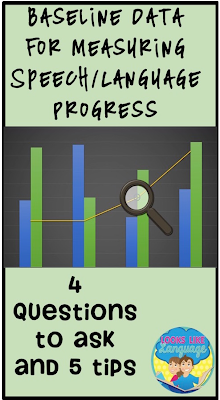 I give my best shot at coming up with an activity I hope each student will be able to accomplish at the end of the school year and take my baselines either from the end point I hope to achieve, or from steps that need to be reached along the way. The first time I do this with a student or a goal, I measure a step I hope will be achieved during the year. If the student accomplishes this step earlier, fantastic! Demonstrate the progress and take a new baseline measure! This is so much more positive than overestimating what a particular student may be able to do, frustrating the student and setting an unobtainable goal. In practical terms, what does this look like at the beginning of a school year? It is definitely a stressful scramble in the beginning, but if you are able to stay with the same type of population over a few years, you start to see some patterns and can fine tune your measures. 1. Get a quick LANGUAGE SAMPLE (oral or written) related to the specific goals you will be addressing this year. 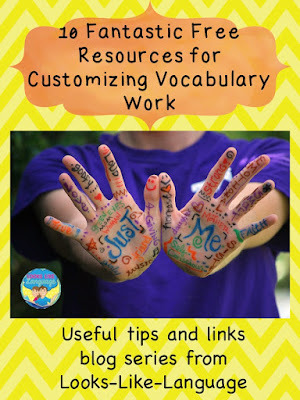 I try to collect some fun activities that will accomplish this, but I do resort to worksheets that address each skill. I keep some page protectors with a copy of worksheets that combine the IEP goals, often ones at ends of units, so I can make photocopies easily at the beginning of the year. 2. Read a fun book and get an example of their STORY RETELL. For older students, ask them to tell you about their favorite movie, TV show or game. 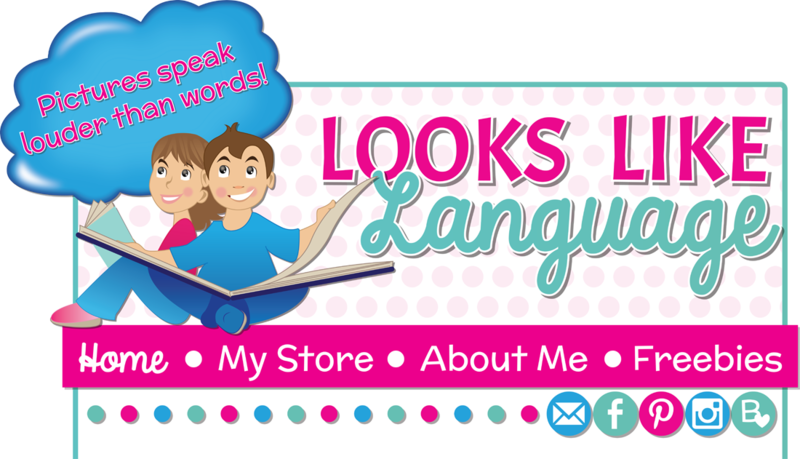 You will learn a lot about their language skills! Being able to tell a narrative is such an important skill. You might be surprised to find which students on your caseload have difficulty with this skill, including students with emotional/behavioral difficulties. 3. Think about board games that you own and what skills are involved in being able to play them. 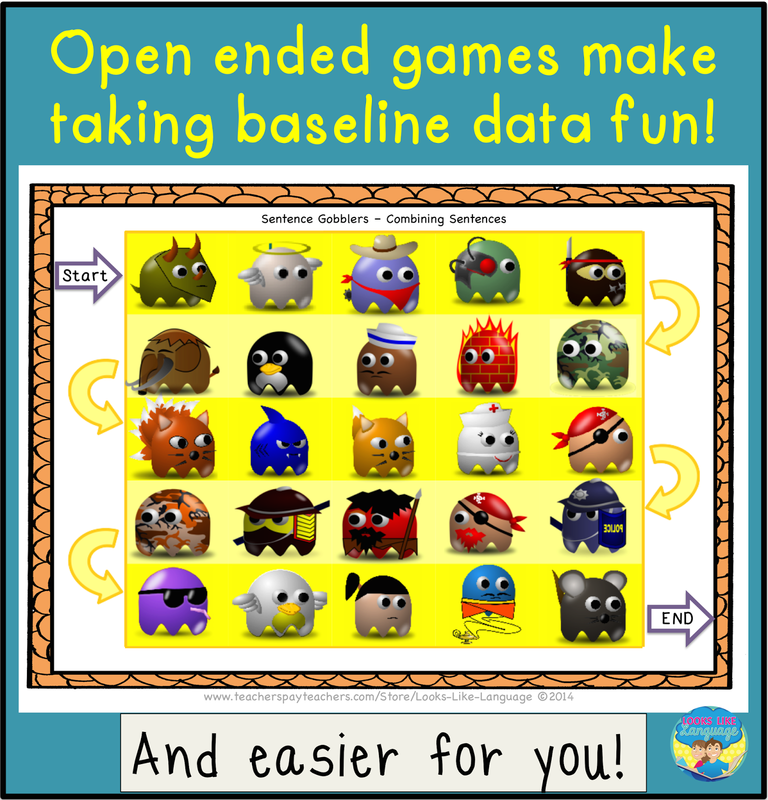 Have your students play the game and take data and qualitative information about what is keeping them from playing easily. This lets you see SOCIAL LANGUAGE SKILLS in action and gives an idea of what to measure more closely afterward. 4. For students who are able to generalize skills, I try to take my baseline performance data from a material that I won't be using regularly to teach the skills. 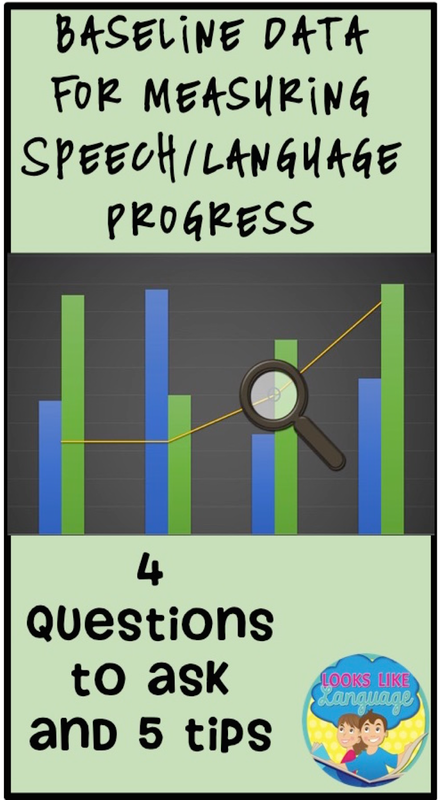 It could be as simple as having a separate set of questions or task cards that I use only to assess performance. OPEN ENDED GAMES are wonderful for this, since you can take measures on a different skill for each student in the group. While this packet has its own task cards, my students have always liked this set of game boards since the characters look like the ones in games! 5. 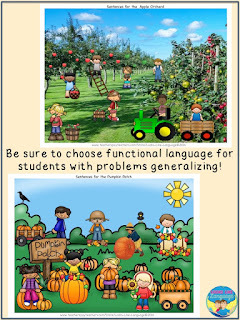 If you have students who need much help to be able to generalize skills, such as those on the autism spectrum, I can't stress enough that you should put a lot of thought into the materials that you are using and make sure that the language relates to a FUNCTIONAL LIFE SKILL! Teacher input and observations of the student in the school environment are essential. When one set of materials is mastered, move to another similar set teaching a slightly varied skill. 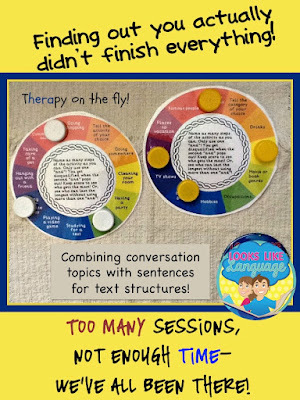 My File Folder Sentence Activities for Autism are one way to do this. Click here to see a post on how to make your own! Your baseline data will just be what the student is able to do the first time you pull out a set of materials and regular data taking will show whether progress is being made. Good luck taking data! Hoping it is a year full of progress! 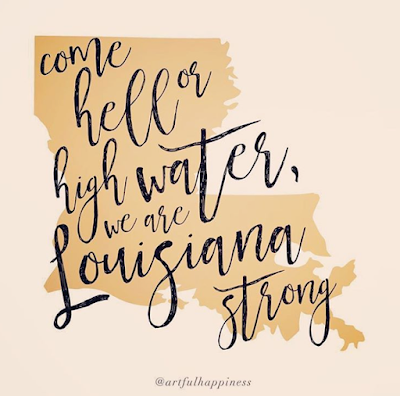 Louisiana SLPs Need Our Help! 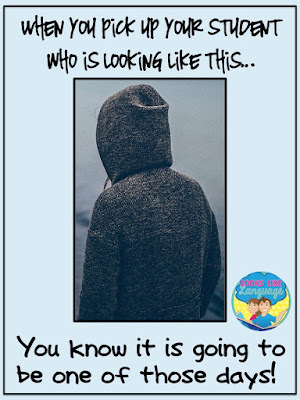 A special request, my SLP and special education friends! Getting the new school year started is always a stressful time, but can you imagine trying to do it with out any of your materials? Without any access to be able to easily reproduce them? Possibly your home gone as well? This is what some of our SLP and Special Education community in Louisiana are experiencing this year. Take a look at this FB post from Mia McDaniel of Putting Words in Your Mouth. If you are able to help the students and educators in Louisiana, and everything will help at this time, I send you a BIG THANK YOU!